For twenty years he victimized the newly arrived Anglo citizens of California who had taken the land from Mexican ranchers when Mexico lost the Mexican-American War in 1847. Vasquez, born in Monterey in 1835 was the great-grandson of one of the earliest settlers in California. His great-grandfather arrived in California as a young man in 1776 with the DeAnza expedition. Vasquez was educated and could read, write and speak both Spanish and English. He was charming, was a skillful dancer, and he played the guitar. But at the age of seventeen, the course of his life took an unexpected turn. In 1852 he attended a local fandango—a lively couples dance—with his older cousin Anastacio Garcia. A fight broke out and the local constable, William Hardmount, was killed. The two cousins, who were not directly involved, still fled the scene. Unfortunately, vigilantes the next day lynched a friend of Vasquez’s, Jose Higuera who did not escape. Vasquez hid in the hills with his cousin Anastacio—who was already a hardened outlaw—Tiburcio picked up his cousin's ways and joined his gang. This started his criminal career--he later led his own group. One of his many hideouts was in the Vasquez Rocks, named after him, just 40 miles north of Los Angeles. He spent the next twenty years in and out of jail for rustling horses, burglaries, cattle thefts and highway robberies. He also became a ladies man especially charming married women—this and three murders would ultimately lead to his downfall. He excused his crimes by stating that he was punishing the Anglos for their discrimination and unfair treatment. In the eyes of many Mexican-Americans of the time, he became a folk hero for his descent. But he sealed his fate when in 1873 he and his gang stole $200 in gold from Snyder’s Store in Tres Pinos—now Paicines—and killed three innocent bystanders. This time his actions outraged the public and gained him national notoriety. While robbing Snyder’s Store, he shot and killed three men in a brutal fashion. One victim was a deaf man who had not obeyed Vasquez’s orders because he hadn’t heard them. Another was a Portuguese man who didn’t speak English. Therefore, he did not understand Vasquez’s commands. The third victim was a hotelkeeper, who stood behind a door in the next room. A random bullet Vasquez shot struck and killed him. To assist with his capture, Governor Newton Booth increased the bounty on Vasquez's head several times until it reached $15,000--an incredible sum for the time. In the end, it was one of Vasquez’s own gang who helped with his capture. Tiburcio's group hid out for six months after the Tres Pinos robbery. During this time one of his members, Abdon Leiva turned himself into the authorities. It turns out Vasquez had been sleeping with Leiva’s wife—so out of jealousy Leiva turned states witness, and for his cooperation and testimony, he received amnesty. 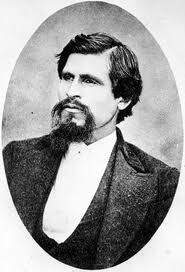 Tiburcio Vasquez was captured nine months after the murders and was taken to Monterey jail where he still received the attention of adoring women. He was tried and convicted and in March of 1875, he was hanged. Vasquez's ghost is seen at the Old Monterey jail where he was held while awaiting his trial. This sand colored building made out of granite was built in the 1850s. No one ever escaped from this six-cell jail—it was in use for over 150 years. Today it is a museum. Several surprised visitors have encountered Tiburcio Vasquez’s spirit. He is seen strolling nonchalantly along the corridor, twirling a six-shooter in his hand. Witnesses have said he smiled at them and then politely demanded they give him their money and watch. Some said when they refused he aimed his weapon at them and then evaporated into thin air. Others, more scared attempted to give him their money but as they went to hand it over he vanished. Another intriguing ghost story connected to Tiburcio Vasquez is not about his ghost but about two of his victims’ spirits. More than fifty years after Vasquez used the foothills around Los Angeles as a hideout a young actress in the early 1900s by the name of Bessie Love ** bought a bungalow in Laurel Canyon. In 1918 when she moved in, she was warned it was haunted. Not believing in ghosts she did not heed this warning. But as it turned out her bungalow sat on the very spot where Vasquez had shot and killed two fortune hunters. While alive it was known that Tiburcio had stolen quite a bit of gold, so many men went in search of his hideout in the hills in hopes of finding his ill-gotten wealth. Unfortunately, two such men ran into Vasquez as they searched. Their ghosts are said to haunt this spot even today. Bessie Love immediately noticed odd happenings in her new home. She heard a low moaning sound, and the doors opened and shut on their own. One electrical problem after another plagued her home. At first, she tried to ignore this activity, but then things became worse. She started hearing men’s voices when she was alone, and there was a pronounced cold spot in her living room. She never talked about this activity until the spring of 1923 when a good friend of hers came to stay at her house. The two made up the sofa for the friend to sleep on, but the first night her friend rushed into her bedroom screaming. She had awoken to the sounds of a man’s voice, and when she looked around, she spotted a ghost walking through one of the living room’s walls. She described how this ghost had paused, taken off what appeared to be a cowboy hat and then not noticing her--he walked passed the sofa and walked toward the kitchen. For the rest of the night, the two women were afraid to go back to sleep. It had been five years since Love had moved in but this was the last straw for her, she packed her things and moved out. In the following years, the bungalow remained unoccupied until a family moved in intending to renovate the building, but they mysteriously moved out leaving the work they started unfinished. In the early 1990s, an electrician who worked at one of the film studios moved in. He and his roommate were perplexed when the bungalow’s front door, which had an old heavy-duty lock-- that both men had found very hard to close--started to close and lock by itself as they worked in the yard. The last time this door shut and locked while they were gone the deadbolt inside slid into place as well. The two men also felt a distinct cold spot in the living room, and several things happened with the electricity that even this electrician by trade could not figure out. They came to believe that the ghosts were letting them know they did not want anyone living in the house. * Even though Vasquez stated he was like Robin Hood he never gave any of his stolen gold to the poor. * Bessie Love was a leading lady of the silent film era. She worked for D.W. Griffith and Thomas Ince. Her youth and good looks lit up the screen. She was able to transition from silent pictures into sound. Her singing and dancing came in handy. She performed in such musicals as 1929's The Broadway Melody which earned her an Academy Award nomination for best actress. 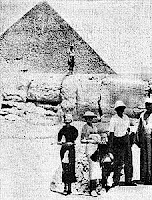 After British archaeologist Howard Carter discovered Tutankhamun tomb in 1922, Egypt became “the” place to visit by the world’s elite. He recounts how they were led down 30 roughly hewn rock steps where their guide, Abdul led them to a stone slab were the remains of a female skeleton lay uncovered. Seton noted that her skull and leg bones were clearly visible, few ribs were left but her spine was intact. As the group moved to leave Seton offered a brief whispered prayer, his wife fascinated hung back to take one more look at the skeletal remains. Unbeknownst to Sir Alexander his wife removed a bone and placed it in her pocket. At dinner that evening with her husband she confessed what she had done. The two examined the smallish heart-shaped bone at which point Seton announced it looked like a grotesque digestive biscuit. Sir Alexander forgot about the bone until he and his wife returned to Edinburgh. Zeyla brought the bone out and the two decided to display it within a former glass clock case in their drawing room. The events that followed this challenged his families’ innocence and ultimately tore them apart. Within moments of the bone being set upon the table in the Seton’s drawing room, panels from the ceiling crashed down almost hitting them. During the next weeks the families sleep was disturbed by sounds of bumps, bangs and thuds. During this time a young cousin who visited the Seton household saw a “ghostly woman dressed in strange clothes” float by. Other guests in the following weeks also spotted this strange apparition in the home's halls. Chairs began to be thrown about and the glass case that the bone rested in mysteriously broke. The legs of the table that the bone sat upon shattered and broke several times. By this time the household was in a major uproar. Sir Alexander locked the drawing room door and determined to keep watch. Nothing happened so he went to bed. But several hours later his wife woke him up stating that someone must have broken into the house. He grabbed his revolver and headed downstairs, he met his daughter’s nanny on the stairs—she was in hysterics. She stated that something was moving around in the drawing room. He went back upstairs to retrieve his keys and when he and Zeyla unlocked the drawing room door a chaotic scene greeted them. Chairs were upset, books were flung about but the bone was undisturbed upon the table. Sir Alexander was surprised to find the windows in the room where all locked and secure. Believing they must have a poltergeist Sir Alexander told his wife he intended to destroy the bone. She forbade him to do this, which caused a prolonged fight between the two. A reporter from the Express getting wind of what was occurring in the Seton residence started to hound Sir Alexander for answers—he refused to comment. But later when this same reporter requested to borrow the bone he allowed it. The Express reporter returned the bone without incident but was later involved in a serious car accident. The activity calmed down for a while but one night as the Seton’s returned from their various engagements the nanny approached them once more in a panic. She had been hearing loud noises in the drawing room all night and then glass shattering. She admitted she was too afraid to enter the room. When the Seton’s did they found that everything was undisturbed except for the bone and table it sat upon. The table rested on its side the bone lay in several pieces on the floor. A reporter from the Scottish Daily Mail was called in to take pictures of it. He like the first reporter borrowed the bone but the next day he returned it because he had become seriously ill. The family prayed and peace returned to house briefly then on Boxing Day they invited over one hundred guests for dinner. Zeyla’s friend had pieced and glued the bone back together and placed it back in the drawing room. As the guests were served cocktails in an adjourning room the conversation inevitably turned to the bone. At this point the table the bone sat upon hurled itself violently across the room hitting the opposite wall. A maid and Zeyla’s cousin Gert both fainted. Even though no one had been in the room where the table had moved people panicked and and the party broke up quickly. The American papers picked up on the story after this incident. Again, Sir Alexander was hounded. Meetings were held with hundreds of attendees to determine what might be going on. Sir Alexander determined, now requested his uncle a Roman Catholic monk ** to come out and “exorcise” the bone—he did this while Zeyla was not at home. * At the time many stories where being published about the supposed “Curse of the Pharaohs”. This curse refers to a wide held belief that if anyone disturbed the remains of an ancient Egyptian, especially a pharaoh that person would then be cursed. ** Sir Alexander Hay Seton was not a catholic but his uncle was. His daughter, Egidia was six at the time. 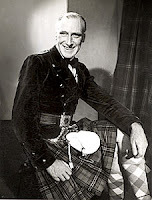 She recalled seventy years later the day her Uncle Charles arrived at the house, causing a scandal, from the Benedictine Abbey at Fort Augustus. *** Even though the activity in the house settled down, Sir Alexander stated that the curse continued to make his and his families lives difficult. At the end he stated he believed in the curse. One of the latest inventions, introduced to the public in 2010, to add to a ghost hunter’s “must have” list is an EVP Field Processor (EFP) developed by Larry Odien for the American Paranormal Research Association. This piece of equipment is a simple but effective addition to how ghost hunters can capture EVP’s. Basically, the EVP Field Processor is a modified digital audio recorder. A while back I wrote a post about how Mark and Debbie Constantino capture EVP’s. One method they use which I really like is that they stop their digital voice recorders after asking questions to listen immediately to see if they picked up a response. Like I mentioned in my original post on this subject this allows the investigator to ask more meaningful questions as they continue with an EVP session. Why I reference this here is the EVP Field Processor is a good match for this method. What the EFP does that a typical digital audio recorder does not do is it has a display screen that provides a “real time” visual of the sounds recorded. In other words the investigator can now see if a sound has been recorded that they did not hear in real time. So if an anomalous spike is displayed and all is silent it just might mean an EVP was captured. This then provides the ghost investigator with a clue to turn off the recorder and play it back to see if they captured something of interest. Another nice feature the EVP Field Processor provides for the investigator is a way to also corroborate evidence, especially if a video camera is focused upon the Processor’s display—it provides a visual recording of the spike when it occurs along with the audio recording. This EFP is a nice practical addition for all ghost investigators whether they are just starting out or have done investigations for years. The EFP has a bright illuminated screen for even very dark locations. It has a very sensitive display, which prevents false positives. There is a baseline adjustment dial for white noise/ambient noise. It also provides an earphone and mp3 speaker jack and it uses a standard 9volt battery. One of the most effective weapons the Germans had in their arsenal in World War l was the U-boat or submarine. These fast moving boats were used to demolish enemy supply ships. In 1916 the “Great War” was literally bogged down in a blood bath of trenches in France and Belgium. Hundreds of thousands of young men in both the Allied forces and Germany were being killed as they inched their way across the Western Front. In 1916 two years into the war the Germans were in a rush to finish construction on twenty-four new U-boats, which they hoped would help them turn the tide. One of these new submarines, U-Boat 65 became notorious within the Kaiser’s navy, for not thwarting the enemy, but for numerous mysterious tragedies. Many seamen connected to this vessel came to believe that she was not only cursed but haunted as well. Even before construction upon U-Boat 65 was completed in 1916 tragedy struck. As the hull was being laid a giant girder held by chains suddenly broke plunging into the shell. One worker was crushed under its massive weight. For over an hour he experienced agonizing pain as his co-workers tried to remove him, but once the huge weight was lifted off, he died. An inquiry established that there was nothing wrong with the chains that had hoisted the girder—no explanation was found to explain why it snapped free. Less than two months later, a second tragedy occurred. Three engineers who were in the U-Boat’s engine room testing the submarines’ dry-cell batteries were overcome by deadly fumes. Before their bodies could be dragged up to the fresh air, they all died. Again, no explanation was found as to why these batteries leaked. Misfortune continued to befall the U-boat. During its first launch out of port, a fierce storm hit the English Channel. The captain ordered her to surface to test her stability in rough seas. One sailor was washed overboard during this maneuver and right after this, as the boat dived a ballast tank sprang a leak flooding the dry-cell batteries with seawater, again the engine room was filled with poisonous gas. Twelve hours later, it was considered a miracle that the ship made it back to port for repairs without even more fatalities. Several days later, as the boat prepared to launch again, a warhead on one torpedo that was being placed on board exploded killing the second officer and severely wounding several others. Once again an inquiry was held, but no explanation for the explosion was ever found. It was at this point the crew decided that their ship must be cursed. The U-boat’s crew went ashore to attend the second officer’s funeral, and then the captain gave them all leave in hopes that things would settle down. But when the ship left port, a week later, a panicked seaman approached the captain to inform him that he had seen the ghost of the dead second officer. The captain ignored this report feeling the seaman was probably hung over from shore leave. Days later the captain was taken aback when a second crew member reported seeing the apparition of the second officer as well. He listened as this man described how he had seen the dead officer casually come up the gangplank. He went on to explain how this ghost had walked aboard, strolled along, and then looked out over the sea. This man broke into sobs as he described the dead officer had suddenly just vanished. These two reports spread like wildfire among the crew, which were now firmly convinced the U-boat they served on was both cursed and haunted. This apparition next appeared in the boat’s engine room observing the instrument panel. By this time the entire German naval armada had heard about these ghostly sightings. The captain did his best to dispel this talk noting his 34-man crew’s morale was badly shaken. But by January of 1918, even the captain had given up trying to dismiss the sightings—for he too had seen the apparition. 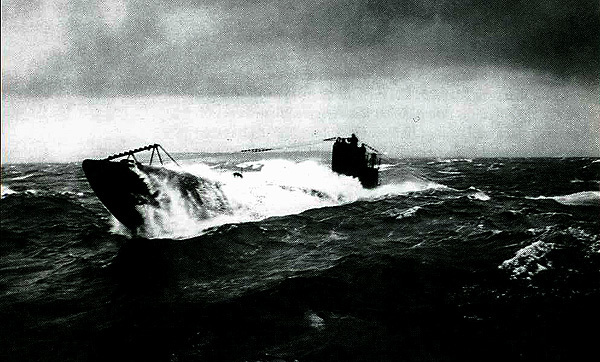 The U-boat was making its way through extremely rough seas in the Channel when the captain ordered the vessel surface. A crewmember opened one hatch to observe the stormy horizon. He was shocked to see an officer standing on the port side of the deck, which lurched violently with each wave toss. At first he wondered why a crewmember would be so foolish to be standing there. But when he realized that all the hatches were still battened down, except for the one he had climbed through, he was very alarmed for no one had passed him. He then spotted the officers features and realized it was the ghost of the dead second officer. Summoning the courage to move he shouted to his shipmates that the spirit was indeed on board. The crew below went into a panic. The captain realizing he must gain control, quickly headed up the ladder only to see the dead second officer's features twisted in agony. Seconds later, the ghost vanished into the raging waves hitting the boat. 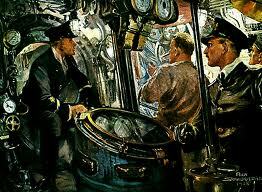 U-boat crews were some of the most courageous men during the war. It was a given that they only had a 50-50 chance of returning from their assigned missions. So when the U-boat 65 crew became too terrified to return to their vessel, an inquiry was held out of respect for these men. The Kaiser’s navy couldn’t officially declare a ship haunted but they re-assigned these men to other submarines and destroyers. The Germans then took a most unusual step—they called in a civilian enemy—a Belgium Lutheran pastor to do an “exorcism” of the craft. After this, a no-nonsense captain was assigned to the “cleansed” ship with a new crew. He immediately let it be known that no talk of ghosts would be tolerated. Things were calm for a while then in May of 1918, the ghost made several more appearances. 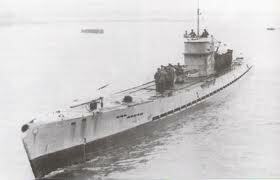 U-boat 65 had orders to patrol the supply lanes off the Spanish coast and in the English Channel. During this mission, a petty officer swore he saw the dead second officer walk through a solid iron bulkhead into the engine room. Another crewmember whose assignment was to man the torpedoes was driven mad by the appearance of the second officer’s apparition several nights in a row. This crew member was so terrorized that when the vessel surfaced to recharge its batteries, he leaped to his death off the deck. The curse that plagued U-Boat 65 came full circle just four months before the Armistice was signed that ended World War l.
In July of 1918, an American submarine spotted U-Boat 65 sitting on the surface like a sitting duck. Not believing their luck they prepared to fire a torpedo but to their amazement before they could the U-boat inexplicably exploded. To this day the reason for this explosion is not known but many people at the time were not surprised. This story took place in France in the mid-thirteenth century. It is considered to be one of the oldest cases of fraud that was officially recorded. What is amazing is the main player in this story, King Louis lX, had no idea that he was a victim of a very ingenious scam—even at the end. But as it turns out this scam was harmless and today people look back upon it with humor. 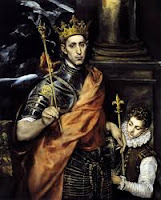 King Louis lX was the last king of France. His piety earned him the title of “Saint Louis”. King Louis heard about a like-mined group from his father confessor-- monks from the Saint Bruno order-- who impressed him with their pious goodness and learning. He announced that he desired that a community of these monks be established near Paris. The superior of Saint Bruno, Bernard de la Tour, sent six of his brethren to the village of Chantilly where King Louis gave them a handsome house. But once established these six monks noticed from their windows that a very imposing palace stood empty nearby. They discovered that this ancient palace of Vauvert had been built as a royal residence by King Robert—but had been deserted for many years. The six monks decided that Vauvert would suit them but because it is said they possessed “an excessive modesty” they did not dare ask the King for a grant to live there. Instead, the Saint Bruno monks devised an ingenious plan, which they all agreed upon. Before their arrival in Chantilly, Vauvert had always had a stellar reputation in the neighborhood but with the arrival of the monks this palace's reputation changed drastically. Vauvert quickly gained a bad name. Now, frightful shrieks were heard emitting from it at night. Witnesses began to see blue, red, and green glowing lights at its windows that would just disappear. The clanking of chains was heard within the palace and the howls of people seemingly in great pain were heard echoing from its walls. These disturbances were seen and heard for several months terrorizing the entire neighborhood. King Louis was informed of all these unnatural occurrences. A description was given to him of a large apparition, which had a white beard and was cloaked all in pea-green. This apparition appeared to have a long serpents’ tail and was seen regularly at midnight at one of the palaces’ center windows. Several people who had dared to pass the palace at night stated this figure had shaken its fist at them and howled loudly. The king sent one of his commissioners to investigate. When quizzed the six Chantilly monks feigned shock and stated they were very disturbed “that the devil should play such antics” and right near their own dwelling. They hinted to the king’s commissioner that if they were allowed to inhabit the palace, they soon would banish the evil spirits. The king grateful for their offer immediately drew up a royal order—that the palace of Vauvert would forthwith become the property of the monks of Saint Bruno. This deed is dated 1259. Once the monks moved into Vauvert the unnatural activity ceased immediately. The lights disappeared and the monks stated they laid the green ghost to rest forever under the waters of the Red Sea. These six monks were indeed educated but as for being the most pious—I leave this to the reader to decide.